It took a tweet from fellow PC World'er Jason Cross to tear me away from my copy of Final Fantasy XIII, but tear me away it did, because Blizzard's StarCraft II beta has launched. No, I didn't see a personal email saying as much, but sure enough, after logging into my BattleNet account, there it was, a new graphic beside the World of Warcraft thumbnails, this one of the guy who looks a little like Jeff Bridges in an astronaut helmet (if Bridges chewed stogies and made grumpy faces and wasn't actually a guy who's been living in a crazy electric cyber-verse for the last 25 years). Point: Even if you haven't received an email, check your BattleNet account. Your moment of zen may be waiting. Can't say much more than that, since it'll be three hours until my copy's finished downloading, but I can comment on the download process: It's a client much like the WoW downloader using peer-to-peer with an option to disable background throttling, and the initial "installer tome" download size reads 1.64 GB. No word whether I'll be pulling down patch files after the first file, though I'm sure we'll see several in the days to come. 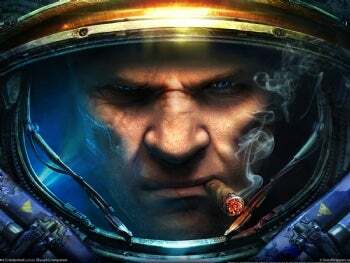 The original StarCraft came out over a decade ago and went on to pretty much take over South Korean gaming (the game was still getting official patches through January 2009). Hard to believe the sequel--okay, the very closed preliminary beta version of the sequel--is slowly pooling, byte by byte, in my downloads folder.